1. After improving slowly in the years immediately following the Great Recession, North Carolina’s economic growth rate has recently accelerated, posting the 10 th fastest output gain among states in 2015. This is the same pattern the state followed after the 2001 recession. 2. However, just as at the national level, the state’s economic growth rate has been low by historical standards as well as compared to the economic expansion of the early 2000s. Part of the reason is a reduction in population growth in the state. 3. The state’s labor market has also recently improved, with increases in employment, an increase in the labor force participation rate, and reductions in each of the alternative measures of the unemployment rate. 4. Yet a worrisome trend is a drop in the productivity of the state’s workers relative to national worker productivity. Also, jobs in the state have expanded the most at the two ends of the wage scale – higher-paying jobs and lower-paying jobs – with the slowest growth being in middle-paying jobs. 5. Regional differences in economic improvement have continued – and actually accelerated – during the current economic expansion. Charlotte and Raleigh have expanded their job bases by an astonishing 20% since the end of the Great Recession, while several regions have seen little or negative job growth. 6. In line with national projections, economic growth in the state should continue for the remainder of 2016 and for 2017. A total of 86,000 payroll jobs will be added in 2016, with 90,000 forecasted for 2017. 7. Still, economic growth in the state will be uneven, with several regions registering unemployment rates under 4% in 2017, while others will have rates of 6% or higher. Executive Summary: More like the Nation? In the presidential election, North Carolina is now considered a “battleground state”. This means the state is so evenly divided between the major political parties that either of the two main presidential candidates could win. With its substantial in-migration of households from other states during recent decades, North Carolina is becoming more demographically and politically similar to the nation. 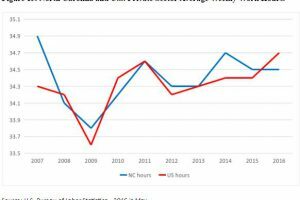 As this edition of The North Carolina Economic Outlook shows, the same could be said of the state economy – it is becoming more like the national economy. Although in the last three years the state’s economy has grown faster than the national economy, the margin for the state has narrowed, particularly compared to the recovery following the 2001 recession. The same is the case for the growth in payroll jobs. 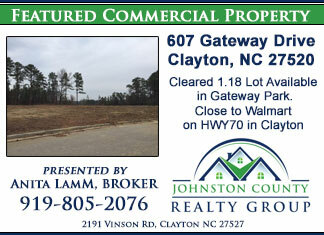 One reason is the slowing of population growth in North Carolina. Prior to the Great Recession, the state’s annual population growth rate averaged over one percentage point higher than the national rate. In recent years it has averaged under one-half percentage point higher. The structure of the state’s economic sectors has also been moving closer to the national structure. Non-durable manufacturing – long a mainstay of the North Carolina economy – has continued to downsize, while durable manufacturing has been expanding. This change mirrors national trends. Also, the state’s information (tech) and professional and business services sectors are growing in relative size just as in the national economy. Yet the on-going transformation of the state economy is creating issues. Job growth has been strongest in both high-paying and low-paying economic sectors and weakest in middle-paying sectors like manufacturing, construction, and government. The number of “discouraged workers” – individuals without work who have stopped looking for a job – appears to be stubbornly stuck at near 50,000 – the same as before the Great Recession. And worker productivity – a key measure for developing new and expanding businesses – has fallen significantly relative to the same measure for the nation since the recession. 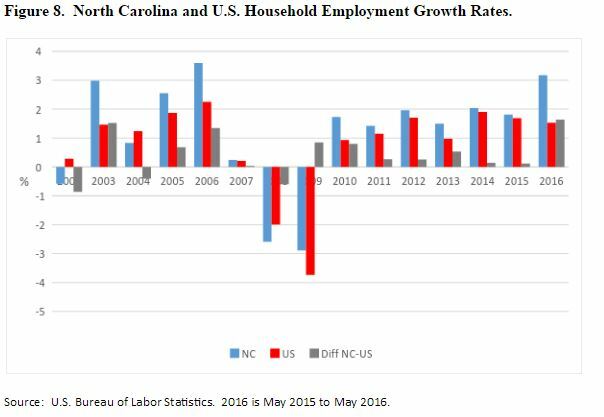 In the modern economy, North Carolina – like most states – has experienced major regional differences in economic growth. These differences have continued – indeed accelerated – since the Great Recession. Charlotte and Raleigh continue to be in a class by themselves, with each posting an amazing 20% payroll job growth rate since 2010. Asheville, Durham, and Wilmington form a second category of strongly growing regions. Unfortunately, several regions of the state have experienced low or negative growth since the end of the Great Recession. Continued economic growth is on the horizon for the state, with 86,000 net payroll jobs projected to be added in 2016 and another 90,000 in 2017. Unemployment rates in the state and the state’s regions will continue to drop, but at varying speeds. By the end of 2017, several regions – Asheville, Charlotte, Durham, and Raleigh – will have jobless rates under 4%. But Fayetteville and Rocky Mount will have unemployment rates of 6% or higher. In June 2016 the nation completed its seventh year of the current economic expansion. However, the expansion has been unusual in several ways. Economic growth – measured by the annual increase in the aggregate value of goods and services produced in the nation (gross domestic product, or GDP) – has been one-third slower than the post-World War II average. The same is the case with annual job growth, which has been one-fourth slower than the long-run average. This sub-par performance is reflected in the fact that the various unemployment rates measuring the condition of the labor market are still higher than their pre-recession levels. Two key financial factors – inflation and interest rates – have also behaved very differently in today’s economic expansion. 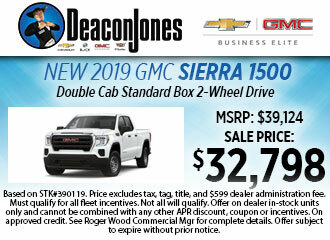 Typically, both the inflation rate and interest rates rise when the economy improves as loan demand increases and the Federal Reserve slows the growth of credit availability. Instead, inflation has remained low (under 2% annually) and interest rates have continued to drop. The 10-year Treasury bond rate set an historical low record in 2016. Low inflation and low interest rates are tied to the slow growing economy. So the essential question is, why is the pace of economic growth relatively sluggish? The potential answers are numerous and can be classified into two camps – demand-side reasons and supply-side reasons. Demand-side explanations cite a lack of consumer spending as the main cause of the slow-moving economy. Specific reasons include rising income inequality shifting income away from higher-spending lower and middle income households, tighter lending standards following the financial implosion of the Great Recession keeping a lid on consumer borrowing, more younger households staying in school longer and therefore delaying the spending associated with full-time employment, and student debt impinging on the ability of college graduates to spend at typical rates. Supply-side answers look to constraints on production for factors behind the modestly expanding economy. 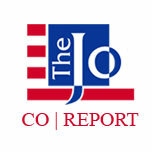 Included are a slowly growing labor force resulting from an aging population and declining birth rates, disappointing improvements in labor productivity, an aging infrastructure challenged to carry more traffic and power, potential disincentives to work arising from government mandates and an easing in federal disability rules, and inadequate training of workers for the modern workplace. Debates will continue among economists and policymakers as the country searches for ways to accelerate economic activity and expand the prospects of prosperity for more households. 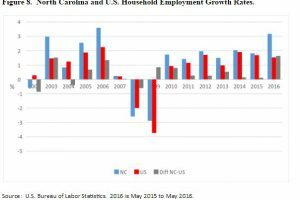 These debates will provide a background for North Carolina’s economy in the second half of 2016 and continuing in 2017. The immediate national economic outlook is for growth to proceed at a moderate pace. With labor markets tightening, wage rates should improve at a faster rate and household buying power should improve. While no official recession is foreseen in the next 18 months, as the economic expansion ages the likelihood of at least a slight economic contraction increases. Figure 1 shows the recent pattern of annual growth in real (inflation-adjusted) gross domestic product (GDP) in North Carolina and the nation. The significant drops in real GDP in 2009 reflect the Great Recession. 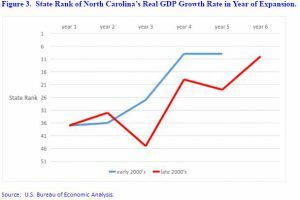 With one exception (North Carolina in 2012), the annual growth rates in both the nation and North Carolina have been positive since 2009, indicating expanding economies. However, two differences are clearly seen in the figure. 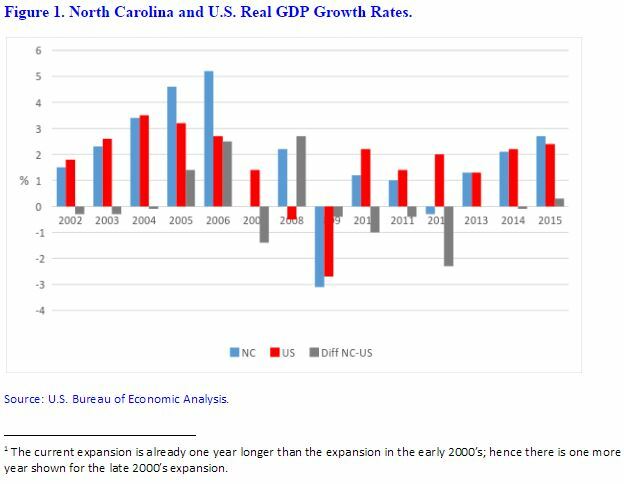 First, both North Carolina’s and the nation’s real GDP growth rates were significantly higher during the previous economic expansion from 2002 to 2006 than in the current economic expansion of 2010-2015. In the case of the state, the average annual growth rate from 2002-2006 was 3.4% compared to the 1.3% for 2010-2015. This is evidence of a slowdown in economic progress. 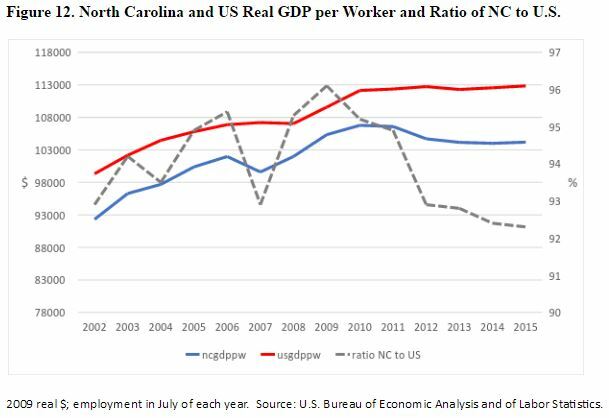 Second, whereas North Carolina out-performed the national economy during the 2002- 2006 expansion, to date the state has under-performed in the current expansion. 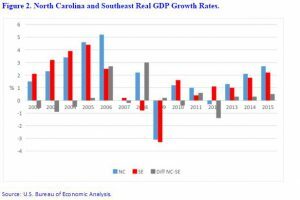 The difference between North Carolina’s real GDP growth rate and the national growth rate is shown by the gray bars in Figure 1. 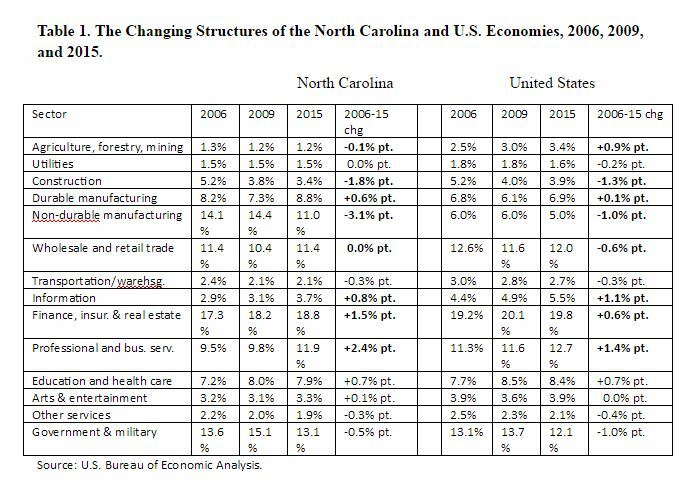 While North Carolina slightly under-performed the nation in 2002, 2003, and 2004, the state grew much faster than the nation in 2005 and 2006. The same pattern began in 2010-2013 of the current expansion, but with the under-performance of the state much greater compared to the earlier period. But when the state’s economic growth did accelerate in 2014 and 2015, state growth was slightly under national growth in 2014 and only slightly better than national growth in 2015 – particularly compared to 2005 and 2006. In total, from 2002-2006 North Carolina’s real GDP growth rate over-performed the national rate by an annual average of 0.6% points. But in the recent expansion of 2010-2015 the comparison was flipped, with the state’s real GDP growth rate under-performing the national rate by an annual average of -0.6% points. Figure 2 shows the comparison between real GDP growth in North Carolina and in the Southeast (Alabama, Arkansas, Florida, Georgia, Kentucky, Louisiana, Mississippi, North Carolina, Tennessee, South Carolina, West Virginia, and Virginia). Like the nation, growth rates in the current economic expansion have also been slower in the Southeast. 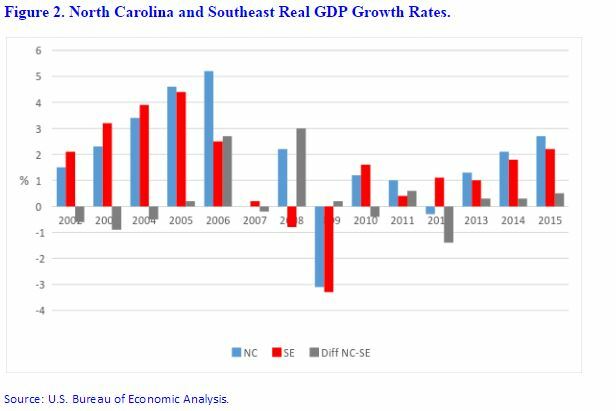 But North Carolina performed better than the Southeast in the recession years of 2008 and 2009. Also, the state’s growth has exceeded Southeast growth in each of the last three years. 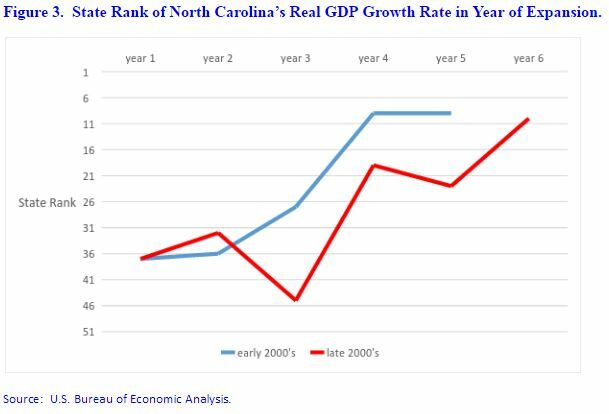 Figure 3 shows North Carolina’s state ranking of real GDP growth by year of the current economic expansion compared to the economic expansion of the early 2000’s. 1 Both expansions have followed the same pattern of North Carolina’s recovery beginning slowly but then rising in the rankings as the expansion continued. 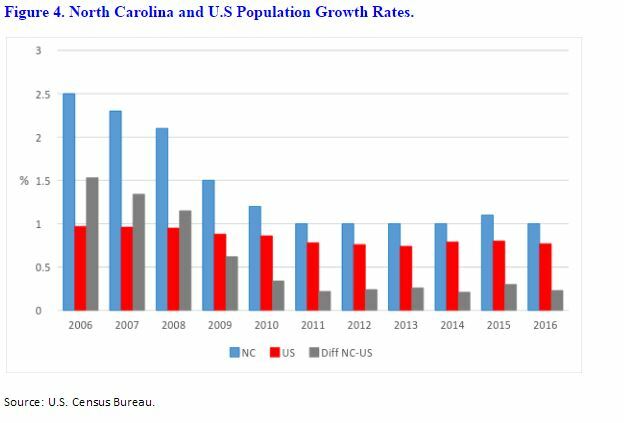 Part of the reason for the slowdown in North Carolina’s economic growth rate compared to the nation’s rate is the narrowing of differences in population growth. Figure 4 shows recent annual population growth rates in North Carolina and the nation. From 2006 to 2009 North Carolina’s population grew substantially faster than the nation’s population, fueled by strong domestic and international migration to the state. The figure shows that in those years the state’s annual population growth rate exceed the annual national growth rate by between 0.5% points and 1.5% points. 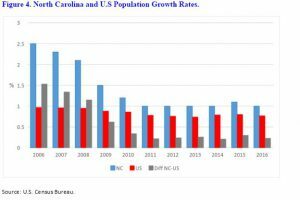 Yet since 2010, while North Carolina’s population growth continues to exceed national population growth, the state’s margin has narrowed to between 0.2% points and 0.3% points annually. The conclusion is that during the current economic expansion, North Carolina has become more like the nation in both economic growth and population growth. Figures 5 through 11 show trends in the labor force, employment, and unemployment in North Carolina compared to the nation. Figure 5 indicates North Carolina’s labor force (employed persons plus unemployed persons who are actively looking for work) has trended upward in the last three years, coincident with an improving economy. The state’s labor force growth has also exceeded the growth in the national labor force. 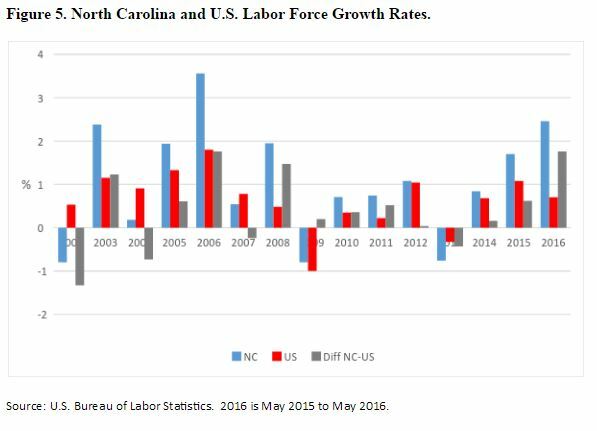 However, excluding 2016 due to lack of a full year of data, North Carolina’s recent labor force growth rates have not yet reached levels achieved late in the expansion preceding the Great Recession. 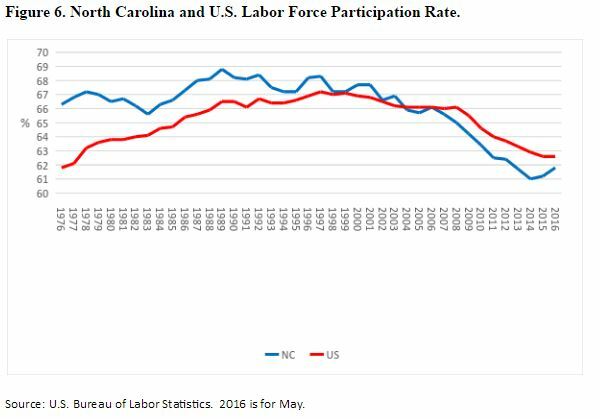 Like the nation, North Carolina’s labor force participation rate (LFPR) plunged in the last quarter century and likely for similar reasons – retiring baby boomers, young adults staying in school longer and delaying full-time work, and a labor market up-shifting its skill requirements and leaving those lacking adequate skills without work. However, in the last almost 18 months the state’s LFPR has trended higher faster than in the nation (Figure 6). Figures 7 and 8 depict the change in employment in the state using the two independent surveys of the job market. Figure 7 gives the results of the payroll survey measuring jobs at places of employment. Figure 8 shows the findings of the household survey gathering information about the job status of individuals from interviews at their homes. Both surveys show the same trends of dramatic drops in employment during the Great Recession followed by improvement beginning in 2010. Compared to employment growth during the expansion prior to the Great Recession, the surveys generally show a smaller positive difference between North Carolina employment growth and U.S. employment growth (gray bar) in the current expansion period (2010-2016) compared to the previous expansionary years of 2004-2007. Figure 9 compares recent payroll employment growth in North Carolina to payroll growth in Southeast states. Growth in payroll jobs in North Carolina led Southeast states’ growth in the early years of the current recovery (2010-2013) but has lagged in the most recent years, although by relatively small amounts. Figure 10 shows the patterns in three unemployment rates for North Carolina and the nation. U3 – the “headline rate” – counts an individual as unemployed only if the individual has no job, wants a job, and has actively looked for work in the last month. Individuals who do not meet the last requirement are termed “discouraged workers”. 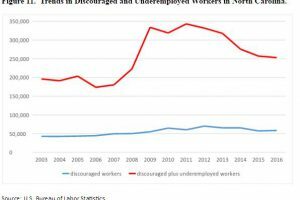 U5 includes discouraged workers as unemployed. U6 further adds as unemployed individuals who indicate they are working part-time only because they cannot find full-time work (termed “underemployed workers”). All three rates in North Carolina have fallen since 2010, although the state rates continue to be higher than their national counterparts. 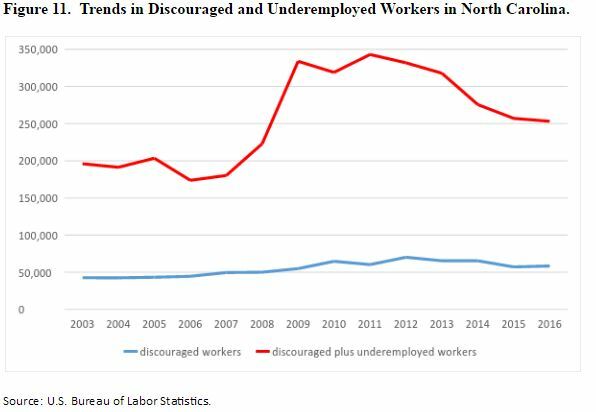 Figure 11 shows trends in the number of discouraged workers and discouraged plus underemployed workers in the state. Again, progress has been made in reducing these numbers in recent years. But both counts remain higher in early 2016 than they were prior to the Great Recession. Thus, using payroll employment growth, which is based on a much larger sample than household employment, North Carolina has performed better than the nation in recent years, but has slightly under-performed the Southeast. Importantly, the state’s labor force participation rate has turned up, while each of the major unemployment rates have turned down. The number of discouraged workers has fallen to near pre-recessionary levels, but still is counting a significant 50,000 individuals. 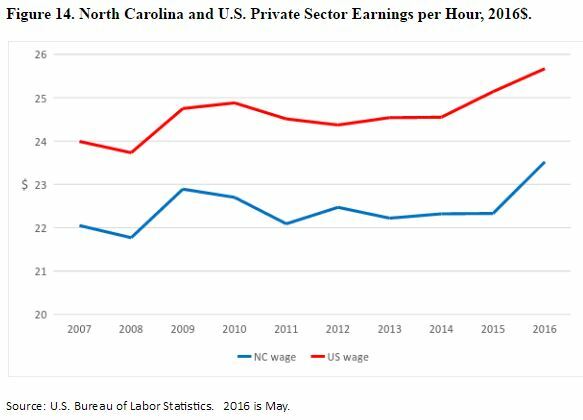 The next series of graphs (Figures 12-18) show trends in economic productivity and worker pay in North Carolina. 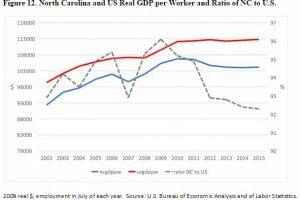 Although worker productivity (GDP per worker) has trended upward this century in both North Carolina and the nation, the rate of increase has slowed this decade and has actually declined in North Carolina since the end of the Great Recession. 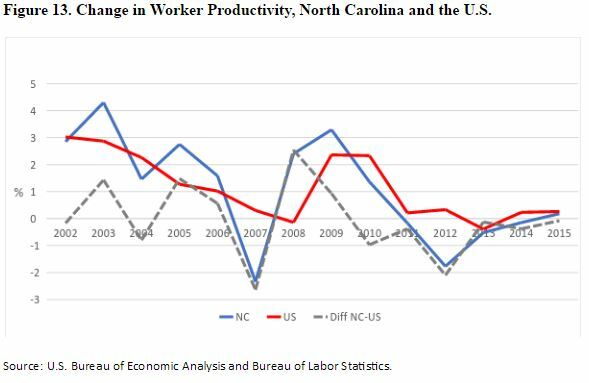 Consequently, worker productivity in North Carolina relative to the U.S. has dropped in recent years (Figure 12). Indeed, from 2011 to 2014 the change in worker productivity in North Carolina was negative (Figure 13). Earnings per hour (wage rate) in the private sector has only recently kept pace with inflation (Figure 14). 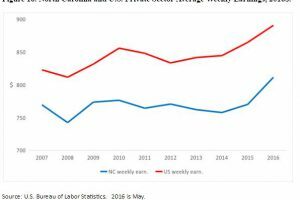 However, average hours worked per week in the private sector have trended higher since the end of the recession in both North Carolina and the country. But while weekly hours worked have returned to pre-recessionary levels in the U.S., they have not in North Carolina (Figure 15). 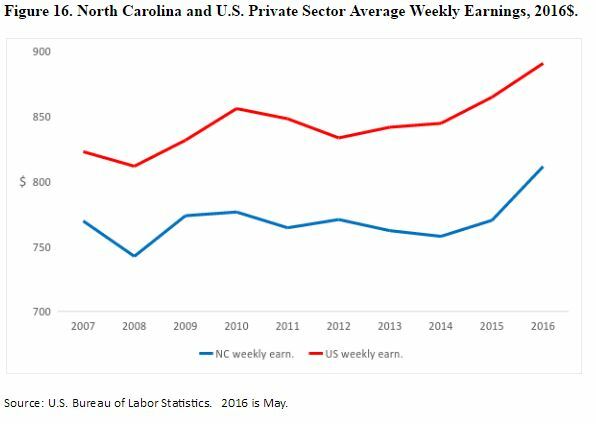 With greater work hours and higher real (inflation-adjusted wage rates), real weekly earnings rose in North Carolina in early 2016 (Figure 16). Figure 17 illustrates employment growth for major economic sectors in North Carolina during the current economic expansion. The sectors are arrayed on the vertical axis from the highest-paying at the top to the lowest-paying at the bottom. If the sectors are categorized as the three top paying being called “high-paying”, the four middle sectors being labelled “middle-paying”, and the three lowest sectors being termed “low-paying”, then a distinct pattern is seen. The sector with the greatest job growth is the high-paying professional and business services sector. 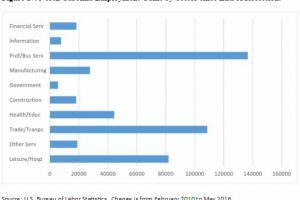 But the sectors with the second and third largest job growth are the low-paying trade/transportation and leisure/hospitality sectors. The four sectors in the middle-paying categories have been among the slowest growing. 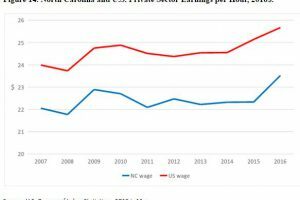 So, like the nation, North Carolina’s job recovery in the current economic expansion has been characterized by strongest job growth in high-paying and low-paying sectors and slowest job growth in middle-paying sectors. This conclusion can be seen in another way when occupations are classified by the type of task performed. Figure 18 shows North Carolina has experienced increasing employment shares of both high-paying problem-solving jobs and low-paying non-routine jobs with a decreasing employment share of middle-paying routine jobs. Economic structure of a state identifies the industries defining a state economy and examines their relative sizes and changes in those relative sizes over time. 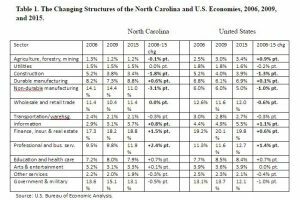 Table 1 compares the economic structure of North Carolina to that of the nation in the pre-recessionary year of 2006, the peak of the recession in 2009, and the latest year of the current economic expansion in 2015. The table reveals two key findings. First, North Carolina’s economy appears to be transforming at a faster pace than the nation’s economy in several ways. The shift out of non-durable manufacturing – traditionally a mainstay of the state economy – to durable manufacturing has been faster in the state compared to the nation during the last decade. Also, the reduction in the relative size of the construction sector has been greater in North Carolina. But, counterbalancing these moves have been larger relative gains in the information, finance/insurance/real estate, and professional/business services sectors. Second, these structural shifts have had profound impacts on the North Carolina labor market. Non-durable manufacturing and construction traditionally have provided middle-income earnings to workers who don’t have advanced educational training. Without significant additional formal education, it is difficult for displaced workers in these industries to find comparably paying work in the expanding information, finance/insurance/real estate, and professional/business services industries. Job opportunities in durable manufacturing are more limited as this industry is rapidly using more technology and machinery for production. And while at the national level job opportunities in the expanding energy sector (included in the farming/forestry/mining sector in the table) have become important options for displaced workers, North Carolina has not been able to develop an energy exploration and production sector. Figures 19 and 20 show the recent economic progress of the state’s metropolitan, micropolitan, and rural regions as measured by the labor market. There are clear differences between the regions when examining changes in payroll employment (Figure 19). 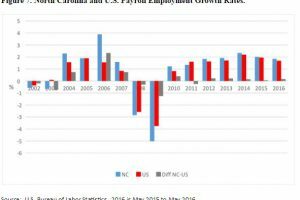 Two regions – Charlotte and Raleigh – are in a class of their own, having registered payroll employment growth of 20% since 2010. 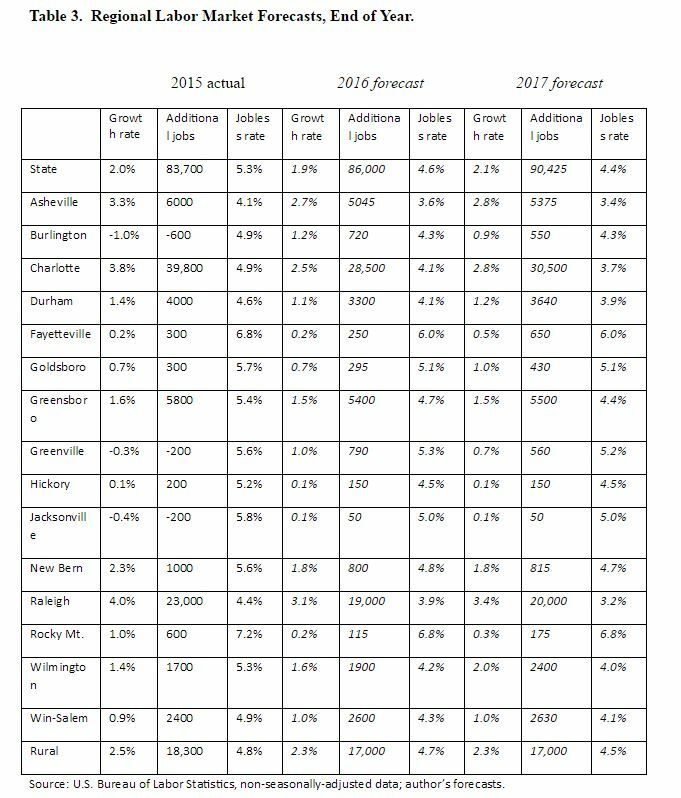 Asheville, Durham, and Wilmington form another category of fast-growing regions with payroll growth between 10% and 15%. 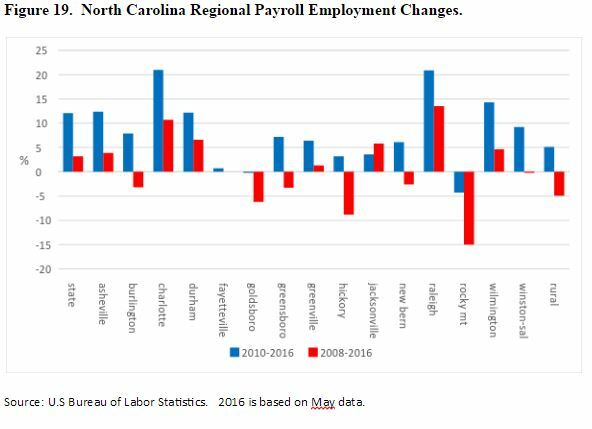 Unfortunately, one region – the Rocky Mount metropolitan area – has continued to lose payroll employment since 2010. Figure 19 also compares payroll employment in 2016 to pre-recessionary employment in 2008. While the majority of regions now exceed their pre-recessionary employment, several areas (Burlington, Goldsboro, Greensboro, Hickory, New Bern, Rocky Mount, and Rural) have not. Figure 20 makes the same regional comparisons using unemployment rates (U3). All regions have experienced a significant decline in the unemployment rate since the peak of unemployment in 2010. 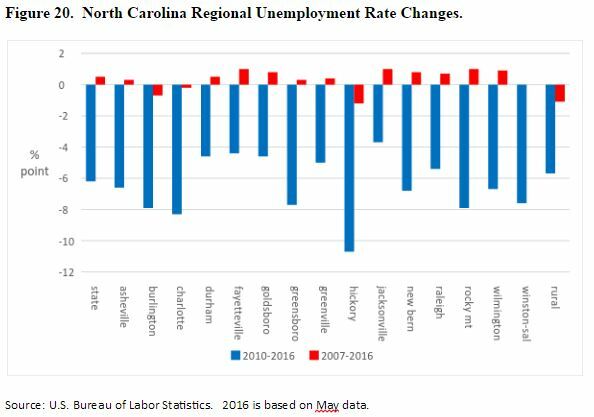 Hickory has seen the largest drop in the unemployment rate, followed by Charlotte, Burlington, and Rocky Mount. Figure 20 also compares the current (May 2016) unemployment rate to the pre-recessionary low rate in 2007. Here the news is not as good. A majority of the regions have jobless rates higher today than in 2007. 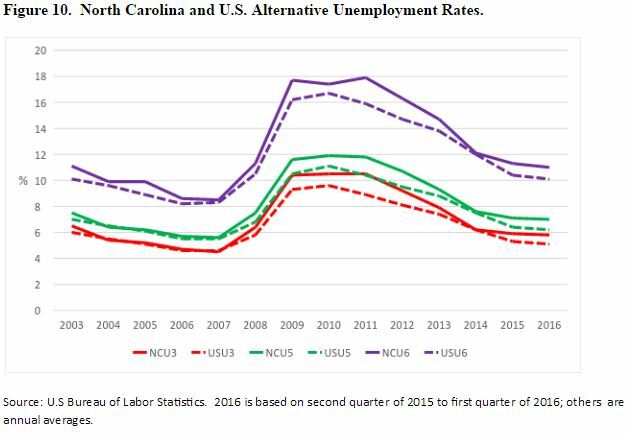 Only Burlington, Charlotte, Hickory, and Rural North Carolina have jobless rates lower today than in 2007. Of course, it is important to remember the disadvantages of the U3 unemployment rate, the main one being the omission of jobless workers who have stopped looking for work as counted as unemployed. Unfortunately, alternative jobless rates that do count these individuals as unemployed are not available at a regional level. 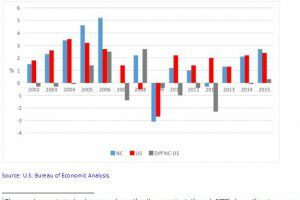 The major conclusion is that regional differences in North Carolina’s economy have continued in the current economic expansion. Indeed, these differences have become more pronounced as metropolitan areas such as Charlotte and Raleigh have had employment growth rates far exceeding other regions. The state has sorted itself into four groups: super-fast growing nationally-ranked metros (Charlotte, Raleigh), above-average growing medium size metros (Asheville, Durham, and Wilmington), slower-growing metro regions (Burlington, Greensboro, Greenville, and Winston-Salem), and regions that are dealing with low, no, or negative growth (Fayetteville, Goldsboro, Hickory Jacksonville, New Bern, Rocky Mount, and Rural). The main driver of economic growth in any country is real GDP. 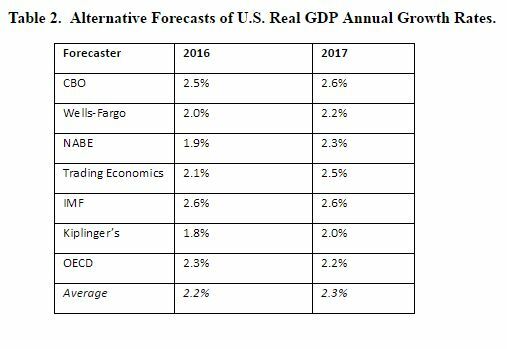 Table 2 shows forecasts for U.S. real GDP growth for 2016 and 2017 from several sources: the federal Congressional Budget Office (CBO), Wells-Fargo Securities, the National Association of Business Economists (NABE), Trading Economics, the International Monetary Fund (IMF), Kiplinger’s, and the Organization for Economic Development and Cooperation. 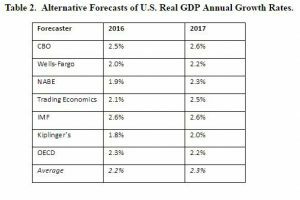 The forecasts are within a narrow range, spanning 1.8% to 2.6% for 2016 and 2% to 2.6% for 2017. The simple average is 2.2% for 2016 and 2.3% for 2017. 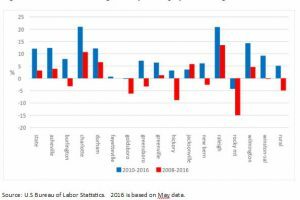 An analysis of the recent state and regional labor markets the show trends in national real GDP to be a main driver of local labor market conditions. 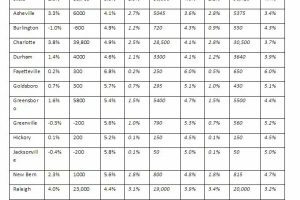 The average real GDP forecasts in Table 2 were used as guides in developing statewide and regional labor market forecasts for 2016 and 2017 for three key factors: the payroll employment growth rate, net additional payroll jobs, and the unemployment rate (U3). These forecasts are presented in Table 3. Compared to 2015, payroll employment growth rates are expected to dip in 2016 for most regions and then modestly rebound in 2017. 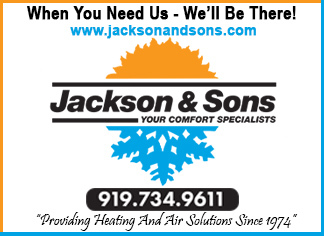 Charlotte and Raleigh will continue their dominance both in terms of growth rates and number of new jobs generated. 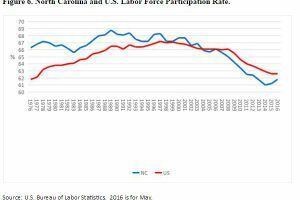 The state is forecasted to reach its pre-recessionary low unemployment rate of 4.4% in 2017, with Asheville, Charlotte, Durham, and Raleigh registering a jobless rate under 4% in that year. In contrast, Fayetteville and Rocky Mount will each have an unemployment rate of 6% or higher in 2017. Looking ahead, there are three major economic issues facing North Carolina. The first is keeping the aggregate state economy growing. Unfortunately, this issue is largely out of the state’s hands, as the majority of the state’s economic growth follows national economic growth. The current economic expansion is already the third-longest since World War II. While the likelihood of a recession is low for the remainder of 2016 and for 2017, the chances rise for 2018 and beyond. The second great economic challenge is preparing the state’s workforce for the new economy emerging in the 21st century. Technology is already replacing labor in routine economic activities, such as those on a factory assembly line or in a farm field. But as the capabilities of technology expands, more human tasks – including those requiring cognitive applications – will become susceptible to technological performance. Retraining displaced workers and training new workers for the jobs of the future will require a significant commitment from the state to avoid massive “technological unemployment”. The third issue is continuing geographic disparities in economic growth and opportunities. Here the state faces the long-standing choice of focusing on bringing jobs to people or bringing people to jobs. That is, should the public policy focus be attracting businesses and employment to regions lagging in economic growth, or should it be to develop skills of individuals living in lagging regions and then facilitate their move to geographic areas with job opportunities? The answer is not easy.